Choosing names for twins is an important responsibility for parents, but it also seems to a hobby for others. You can find many online discussions of what people would name twins, triplets, quadruplets, quintuplets, and octuplets. If you are debating what to name your children, there are helpful resources for parents to choose names for their twins. For example, you can find lists of the most popular twin names. 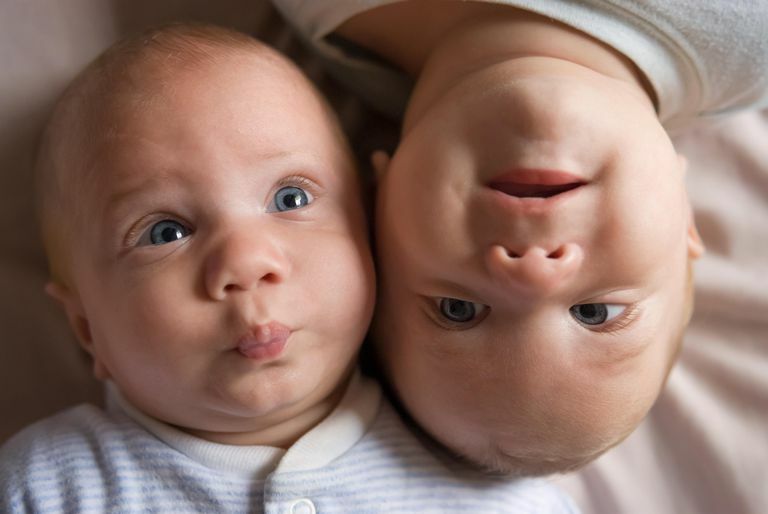 If the name search is getting stressful, you might want to take a step back and look at some creative, lighthearted, and even silly suggestions for names for twins. You never know when a name will strike your fancy, and it's possible that you will discover some realistic possibilities among the names listed here. You can also look at these names and think that at least your choices aren't as silly as those listed. While names can seem important, they are only one small influence on your twins' development. You can take names from popular songs or artists. It can be a blessing or a curse to be identified with these tunes or singers. Caroline and Cecilia: If you'd like your twin daughters to each have a theme song, consider Caroline and Cecilia. They can sing along with "Sweet Caroline" by Neil Diamond and "Cecilia" by Simon & Garfunkel. Be sure to take a good look at the lyrics to see if you really want to make that a child's theme song for the rest of her life. Alison and Veronica: Two girls' names featured in Elvis Costello songs from the 1980s. Elvis Costello is himself a dad of twins, although he has twin boys. Madonna and Rihanna: Consider a combination of superstar singers. There are plenty of well-known female singers known by one name. Try Madonna, Cher, Beyonce, Pink, Ke$ha, Adele, Ciara, Fergie, Jewel, Selena, Enya, Sade, Blondie, and Shakira. NSYNC: Justin, JC, Chris, Joey, and Lance. One Direction: Niall, Zayn, Harry, Louis, or Liam. Male/female duos: For boy/girl names, duos include Sonny and Cher, Donny and Marie, Peaches and Herb, and Ike and Tina. Classic names from literature have been quite popular. You can do a deeper dive to find fun ones. Shakespearean Names: There are several great names for girls found in the works of Shakespeare. Ophelia ("Hamlet") and Cordelia ("King Lear") go particularly well together, but other choices include Portia ("The Merchant of Venice"), Katherine ("Taming of the Shrew"), Viola ("Twelfth Night"), Beatrice ("Much Ado About Nothing"), Goneril or Regan ("King Lear"), and Juliet ("Romeo and Juliet"). For boys, there are Othello, Romeo, Balthasar, Mercutio, Iago, Montague, Claudio, or Falstaff. Darcy and Fitzwilliam: Two classic names for boys, or for a boy and a girl, drawn from Jane Austen's protagonist in "Pride and Prejudice." You can name your twins after universities, cities, and geographical features. Of course, you always face the question of whether that's where the twins were conceived. Meredith and Emory: These are but two of many choices related to colleges and universities. Meredith College is a girls' school in Raleigh, North Carolina, and Emory University is a university in Atlanta, Georgia. Pay homage to your alma mater by naming your twins after colleges such as Auburn, Baylor, Bryn (Mawr), Marquette, Berkeley, Amherst, Trinity, or Juniata. How about William and Mary for a boy and a girl? Or Bama and Bryant for twin boys if you are a fan of the University of Alabama? London and Paris: These names are on recent lists of most popular names for twin girls. Other geographical names include Atlanta and Savannah, Trenton and Jersey, Brooklyn and Manhattan, Virginia and Georgia, Cheyenne and Dakota, Orlando and Jackson. Some names just seem meant to be together. Look for names of famous couples in history, the media, movies, or television. The problem for real-life couples is that there is always the possibility of a breakup. For example, Brad and Angelina might have seemed like a good choice at one time, but not after they divorced. You might think Will and Jada will last, but will they? It is safer to stick with names from older series where you know there was a happy ending.